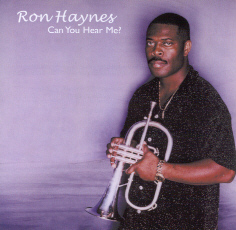 Ron Haynes - Can You Hear Me? Ron Haynes is an established musician. He was a member of the acid-jazz group "Liquid Soul". Liquid Soul "sweeps the mold and mildew out of jazz-funk and breathes it back to glorious life" (Beat magazine). While this group may be only known by insiders, Ron's work with producer and keyboardist Ramsey Lewis ( Urban Knights IV) is his first step into lime light. One can also listen to Ron's music on the project "Urban Knights Presents the Chicago Project" and Mike Manson's album "The Buttom Line". Ron's new album "Can You Hear Me?" was released in 2003 and is his second solo album after "Cool Work" (1997), which is already out of stock. Ron is often compared with smooth jazz trumpet players like Rick Braun and Roy Hargrove, but he presents his own style. My first impression of his new album was electrifying, fascinating and inspiring. Ron's glittering trumpet mixed with a solid rhythm and a funky brass section makes a vivid Lil Bit. Highly addictive and relaxed. Lonely Bird's grooving and shuffling Urban beat reminds me at Ron's "Chicago Project". Ron plays a progressive jazz on his muted trumpet. Perfect the brass arrangement. Definitely first choice is also Tim Gant's work on keyboards. The funk goes on with Keep It Real. Will Howard on bass sets his own landmark. But this song is getting hot with the brass refrain. All is kicked by Ron's trumpet solo. That's the best piece in 2004. PMI (Party Man International) shows up imaginative artistry. Ron mixed some turntable scratching with his well proved brass section. Over all his trumpet. More delightful music with Way Too Coo. Buddy Fambro on his guitar finds my attention. He is also the guitar player on "Urban Knights Presents the Chicago Project". His band is the Chicago group "Rankinfyle". Tell Me is featuring Simone, the daughter of Nina Simone. I hope she will soon step out of the shadow of her great mother and let us hear more of her phenomenal voice. This piece has its own quality and is perfectly tailored to her vocal personality. Another absolute highlight and zenith on this album. Three Dance Boogie reminds me a bit at Herb Alpert's "North on South St". Up beat jazz and hip-hop combined to a contemporary brew. The beauty of Ron Haynes' flugel horn play shines on Flugel Blue. Straight No Chaser is a jazz classic originally released by Thelonious Monk on his album "5 by Monk by 5". Ron's brass playing is tight. Answering Ron's question "Can You Hear Me" with a loud "Yeah" I absolutely recommend this album as the hottest piece of trumpet in this year.